by Rob Manning Follow OPB March 18, 2019 2:05 p.m. | Vancouver, Wash. In the 2016-17 school year, Vancouver Public Schools restrained students an average of once an hour, every day of school that year. Colin and Landon used to be students in the Vancouver Public Schools. But after years of being held, grabbed, carried and isolated, they’re at home. Colin, 12, is on the autism spectrum. His mother, Cara Bailey, says he’s still recovering from what he experienced at school. In a 130-page lawsuit filed last June, the Baileys alleged Colin suffered years of physical and psychological injury from being isolated and restrained, often without his parents knowing. 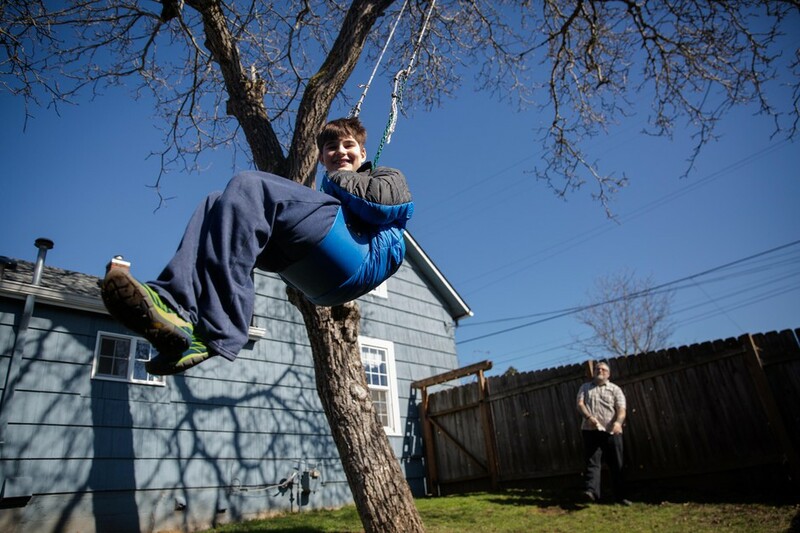 Colin, 12, swings in the backyard of his family home in Vancouver, Wa., while his father, Adam Bailey, pushes him on Saturday, March 2, 2019. The repetitive action of swinging helps Colin, who has autism, calm down. Ten-year-old Landon reads a book while his mother, Sarah McPartland, and sister, Vivian, read on the stairs at their home in Vancouver, Wa., Thursday, Feb. 28, 2019. Vancouver school officials said that there are systems in place to help students like Colin and Landon. Vancouver’s executive director of special services, Daniel Bettis, said the district often creates “behavior intervention plans” for students likely to act out. But even with those plans, educators restrain or isolate students dozens of times a week in Vancouver. Officials say mandatory annual trainings have shifted in recent years toward “de-escalation strategies,” though parents and educators say following through on those can be difficult, with limited staff and time. Cara Bailey says her son’s problems stem from a disconnect between what he needed and what the school provided. Colin needed order and clear expectations. “‘First, we’re going to do this, and then we’ll go out to recess,’” she said. Bailey says Colin should have been assigned a one-on-one paraeducator to help him make sense of lessons and avoid frustrations and need for restraints. Instead, he was given “additional adult support,” which could be less than one-on-one attention. After years of pushing district and state administrators on the issue, Bailey is convinced that Vancouver received funding for a one-on-one, without providing one. Vancouver Public Schools administration “vehemently denies any allegation of inappropriate reporting or misuse” of funds, as Bailey alleges. State officials acknowledged that they didn’t investigate that allegation when they looked at Bailey’s complaint — and said it’s too late to go back and do that now. The broader problem, parents such as Bailey and McPartland say, is that schools are trying to fit students with a broad range of skills and challenges into a limited range of program offerings and supports. Landon, 10, sees that too. “Their problem is, even when they do understand an autistic kid, they’re like ‘Oh, I understand, he likes this,’ then they think all autistic kids are that way,’” Landon said. Meanwhile, special education populations are growing in Oregon and Washington, driven by a rapid rise in children diagnosed as being on the autism spectrum. Oregon’s special education population went up 5 percent over the last six years, while the number of students identified with autism went up nearly 18 percent. Washington saw a 9.6 percent increase in students with disabilities over the same period, boosted by a 44 percent rise in students on the autism spectrum. Inconsistent support was also an issue for Landon, according to his mom. Sarah McPartland said she was impressed with how his second-grade teacher worked to accommodate her son, through technology or adjusting lessons. But the family’s lawsuit suggests turnover in educational aides fueled a decline in Landon’s behavior. And when Landon had the help of paraeducator Audra Morrison, she saw inconsistency from the classroom teachers. Morrison said the second-grade teacher that McPartland loved may have gone too far in accommodating Landon. Between second and third grades, Morrison worked with McPartland on changes to Landon’s Individualized Education Plan, or IEP, so that Landon could learn the way he wanted to, but still keep up with standards. But Morrison said Landon’s third-grade teacher wasn’t on board with that. “When it came to his new teacher, it was never focused around Landon, it was focused around fitting the needs of her classroom, and fitting the needs of her as a teacher,” Morrison concluded. Landon says the rigorous approach was intolerable. School staff had to chase him down. Landon thought the school told his mother what occurred. When McPartland finally learned, six months later, it led to a humbling mother-son talk. “It’s never great to be in a position as a parent when you have to go back to your child and say ‘I heard that this happened,’ and that you’re sorry, and the response from your child is ‘What does it matter, you weren’t there to help me?’” McPartland said. Bailey and McPartland have both reached financial settlements with Vancouver Public Schools but are not allowed to discuss the details of them. Neither family is entirely happy. The Baileys feel like they still have unanswered questions about how the district handled special education funds. The McPartlands argue the money they were paid would be better used serving kids like Landon. District officials downplayed the problems cited by parents like these, asking OPB how many parents had been interviewed. Administrators pointed out they represent a small fraction of Vancouver’s 3,000 students receiving special education. 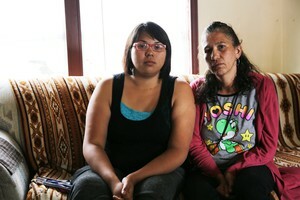 Since suing the school, McPartland and Bailey have both heard from parents in Vancouver and elsewhere who have experienced similar problems with restraint and isolation. When Melissa Shurman’s son started at a Vancouver kindergarten last year, he was a happy kid. “Now he’s a little different,” Shurman said. Brayden has an intellectual disability. His IEP, or individualized education plan, calls for a careful balance between a specialized setting and a traditional classroom. Instead, Shurman said her son was in a traditional classroom all the time — and in over his head. Shurman started to suspect teachers were frustrated, too. She’d hear them yelling at students when she visited. She says while Brayden’s classmates wrote letters, her son would scribble. “To him, that’s doing his work,” Shurman said. She says Brayden came home with two versions of an assignment once: one with scribbles; one, done correctly. The papers also contained a message. “It’s written on it saying ‘He refused to do, he refused to even try,’ and they did ‘hand-over-hand assistance,’” Shurman said. Shurman suspects Brayden’s teachers grew impatient or frustrated. “All that’s telling me is he was very upset, and was having a hard time and not doing it, and they grabbed his hand and forced him to do it,” Shurman concluded. Brayden started showing his mom, by crossing his arms, how staff in his kindergarten room would hold him still. Less than three months into school, Shurman had removed Brayden. She doesn’t know how many times Brayden was restrained. Like the McPartlands and Baileys, she says notification came late, or not at all. This story is the second of a three-part series about Oregon and Washington students being restrained or isolated from their peers. You can read part one here and part three here.